the sun, on the outdoor arena. The horses did great! 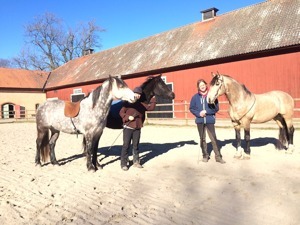 Simba (black arabian) had so much energi and did not have the time to listening, just jumping and running around ;-) . But then suddenly he realize that it was fun to be with us, and the training session have never been better! Today its also time for "Saturdaytraining". That means, Stine and Therese is giving private lessons all day long, to students witch is living near by, and easily can travel to us, for one day of traning. Hope you will have a wonderful weekend!